The 2013 Sportovec Roku (Athlete of The Year) Awards were staged at the TOP Hotel in Prague, broadcast live on Czech national TV channel CT1 and enjoyed by an audience of 400 guests and VIPs who amassed to honour the very best of Czech athletes. Robe at Sportovec Roku (photo credit: Lucas Pelech)Freelance Lighting Designer Pavel Jelínek was asked to light the show – for which he specified Robe moving lights, including 18 x ROBIN Pointes together with four ROBIN LEDWash 1200 and four ROBIN LEDWash 600s. The stage was limited for space, and the time in which to get everything rigged, focused and ready was tight, so this defined some elements of the lighting design. Jelínek wanted high quality lightweight fixtures that were bright and above all fast and easy for the crew to rig. 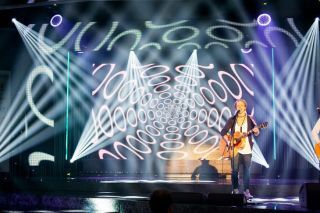 In addition to the Awards presentations, the show featured live performances by Czech music stars singer / songwriter Tomáš Klus and pop singer Debbi, so the rig needed to be flexible and adaptable. Robe fixtures delivered a solution - The Robe equipment was supplied by Slovakian rental company Q-99. The company’s owner Martin Kubanka is Slovakia’s leading TV LD, and he and Jelínek will often co-operate on productions in the Czech Republic. Q-99 has a large amount of Robe in its rental inventory and has recently invested in 48 Pointes, Robe’s new multi-purpose fixtures for the benefit of all their work which includes many high profile TV shows and live events. Jelínek enthusiastically embraced Pointes for the first time on Sportovec Roku. Four Pointes were positioned on the floor with two rows of seven fixtures on the back truss, all utilized for a wide variety of effects, including beams, gobos, colour washes and sweeps. The LEDWashes were positioned on the trussing above the stage. Jelínek has used LEDWashes for some time on his designs and finds them effective, lightweight and very bright LED lightsources with a good selection of whites. For this show, he also made the most of the individual ring control to create camera-friendly effects. The show was directed by Roman Petrenko and the Director of Photography was Filip Havelka.